Back cover blurb: ‘Little dancer,' Mengele says, 'dance for me'. In 1944, sixteen-year-old Edith Eger was sent to Auschwitz. There she endured unimaginable experiences, including being made to dance for the infamous Josef Mengele. Over the coming months, her bravery helped her sister to survive and led to her bunkmates rescuing her during a death march. When their camp was finally liberated, Edith was pulled from a pile of bodies, barely alive. 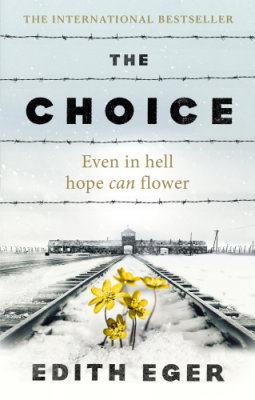 In The Choice, Edith Eger shares her life, remarkable because her years in the concentration camp encouraged her to find a hope and resilience that most of us would never think was possible. It wasn’t easy but, as she tried to find a future for herself after the Second World War, partly by helping many others through their own versions of trauma, she discovered an honesty, strength and empowerment within herself that makes for a memorable and inspiring read. Compelling, truly remarkable, and ultimately triumphant, The Choice is the unforgettable memoir of a woman who has seen the worst and lived the best. Imagine your worst nightmare, several times over, and then even worse again, and Edith Eger has lived it. A survivor of three Nazi “labour” camps; Auschwitz, Mauthausen and Gunskirchen, as Jews, Edith and her sisters survived the war by a combination of strength, determination and luck. They were shot at, singled out and humiliated. Yet somehow they each survived their ordeal, making them much stronger individuals. When the war was over, each of them found it difficult to come to terms with what had taken place. The brutality and horror of the conditions that they’d been subject to, and the loss of other family members that they were separated from. Somehow they moved on and got on with their lives. Edith ending up in America with a new husband, and building a new life and family away from her home country that bought so many memories. However Edith didn’t escape the past fully, and didn’t realise that she was suffering from post traumatic stress until much later on life, when her behaviour in certain situations was questionable to say the least. So Edith decided that she needed help, and in doing so, found that she wanted to help others. For many years Edith has been a celebrated psychologist helping others with PTSD. She is a remarkable woman, as are her sisters. This is a book that will make you re-evaluate your life and the decisions that you make on a daily basis. It will also make you truly grateful to be alive. The Choice is available now via Amazon online and all good book shops.